WHITTIER – Rio Hondo College Superintendent/President Teresa Dreyfuss has been named a 2019 Distinguished Woman of the Year for the 57th Assembly District in recognition of her contributions to the community. 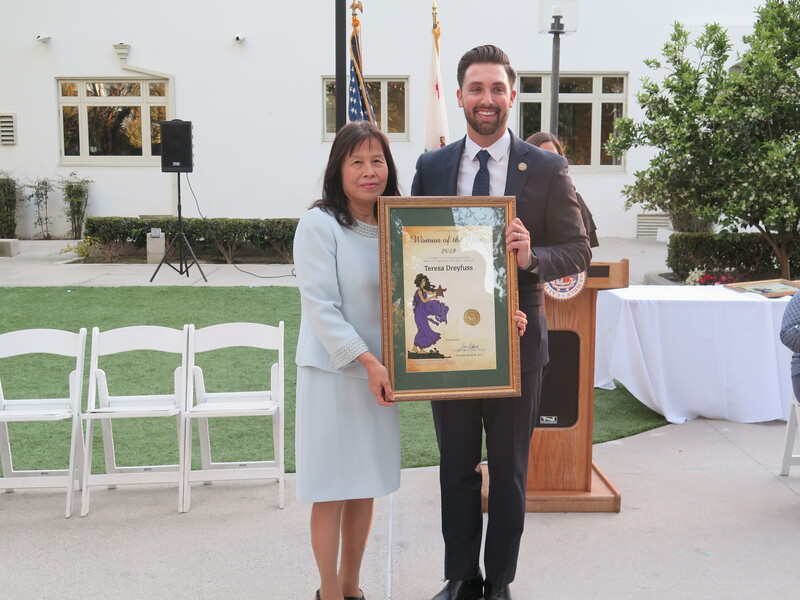 Assembly Majority Leader Ian C. Calderon, who represents the 57th District, honored 10 distinguished women during a March 28 event at The Clarke Estate in Santa Fe Springs. Dreyfuss was nominated by Pico Rivera Mayor Pro-Tem Gustavo Camacho and Huntington Park Public Works Director Daniel Hernandez for her role at Rio Hondo College and her commitment to supporting the community. “I have worked with many great community leaders over the years, but Ms. Dreyfuss stands out for her leadership, experience, professionalism, integrity and her commitment to community,” Camacho wrote in his nomination form. “I believe she exemplifies courage, strength and vision through her accomplishments working at the college and in the community she serves,” Hernandez wrote. Dreyfuss, who retires on June 30, has served Rio Hondo College for more than 30 years, starting in 1987. She started as a senior accountant and worked her way up to the leadership post. She was appointed permanently to the post in 2013 after a brief time as the college’s interim leader. During her service, she helmed a $250 million construction program that remade the aging hilltop campus into a modern institution, as well as establishing three regional education centers to serve students close to their homes. Dreyfuss, who holds an MBA from the University of La Verne, is an immigrant from Taiwan who has drawn on her experiences to inspire students to achieve their dreams. She has also served as an adjunct instructor at Rio Hondo College and other institutions. She is a member of Soroptimist International of Whittier, Soroptimist International of South El Monte and El Monte, L.A. County Fourth District Consolidated Oversight Board, Los Angeles Orange Regional Consortia, the Whittier Historical Association, the National Association of Latino Elected and Appointed Officers and the American Association of University Women, She serves as vice chair of the City of Whittier’s Sister City Committee and senior advisor to the L.A. Positive Chinese Association. Dreyfuss has been praised from many fronts for guarding Rio Hondo College’s finances through the Great Recession, ensuring stability even when other institutions struggled, and increased student graduation, completion and transfer rates during her tenure as superintendent/president. RHC_Honor_1: Rio Hondo College Superintendent/President Teresa Dreyfuss has been named a 2019 Distinguished Woman of the Year for the 57th Assembly District in recognition of her contributions to the community.